By Paul Watson on May 7, 2013 . This is my second draft of an idea of how to mark up artwork using Schema.org (the first draft is here). Your comments and criticisms would be gratefully received. My desire to create a new Schema.org type for artwork came about because of my annoyance with the limited vocabulary in the currently available types (most notably, the lack of a “type” for visual artforms other than painting, sculpture, and photography, such as printmaking, drawing, collage, assemblage, digital art, etc.). I should state that this is just an idea of mine – it is not an accepted Schema.org type and so should not be used on a production website! However I will soon be posting have just posted it on the public-vocabs mailing list to see if it has enough support to be considered. URL An additional type for the item, typically used for adding more specific types from external vocabularies in microdata syntax. This is a relationship between something and a class that the thing is in. In RDFa syntax, it is better to use the native RDFa syntax – the ‘typeof’ attribute – for multiple types. Schema.org tools may have only weaker understanding of extra types, in particular those defined externally. Text A short description of the item. URL URL of an image of the item. Thing The subject matter of the content. Person Specifies the Person that is legally accountable for the CreativeWork. Text A secondary title of the CreativeWork. MediaObject The media objects that encode this creative work. This property is a synonym for encodings. Audience The intended audience of the item, i.e. the group for whom the item was created. AudioObject An embedded audio object. OrganizationorPerson The author of this content. Please note that author is special in that HTML 5 provides a special mechanism for indicating authorship via the rel tag. That is equivalent to this and may be used interchangeably. Text An award won by this person or for this creative work. UserComments Comments, typically from users, on this CreativeWork. Place The location of the content. Text Official rating of a piece of content—for example,’MPAA PG-13′. OrganizationorPerson A secondary contributor to the CreativeWork. OrganizationorPerson The party holding the legal copyright to the CreativeWork. Number The year during which the claimed copyright for the CreativeWork was first asserted. OrganizationorPerson The creator/author of this CreativeWork or UserComments. This is the same as the Author property for CreativeWork. Date The date on which the CreativeWork was created. Date The date on which the CreativeWork was most recently modified. Date Date of first broadcast/publication. URL A link to the page containing the comments of the CreativeWork. Person Specifies the Person who edited the CreativeWork. AlignmentObject An alignment to an established educational framework. Text The purpose of a work in the context of education; for example, ‘assignment’, ‘group work’. MediaObject A media object that encode this CreativeWork. MediaObject The media objects that encode this creative work (legacy spelling; see singular form, encoding). Text The language of the content. please use one of the language codes from the IETF BCP 47 standard. Text A count of a specific user interactions with this item—for example, 20 UserLikes, 5 UserComments, or 300 UserDownloads. The user interaction type should be one of the sub types of UserInteraction. Text The predominant mode of learning supported by the learning resource. Acceptable values are ‘active’, ‘expositive’, or ‘mixed’. Boolean Indicates whether this content is family friendly. Text The keywords/tags used to describe this content. Text The predominant type or kind characterizing the learning resource. For example, ‘presentation’, ‘handout’. Thing Indicates that the CreativeWork contains a reference to, but is not necessarily about a concept. Offer An offer to sell this item—for example, an offer to sell a product, the DVD of a movie, or tickets to an event. OrganizationorPerson Specifies the Person or Organization that distributed the CreativeWork. Organization The publisher of the creative work. URL Link to page describing the editorial principles of the organization primarily responsible for the creation of the CreativeWork. Review A review of the item. Review Review of the item (legacy spelling; see singular form, review). Organization The Organization on whose behalf the creator was working. Text The textual content of this CreativeWork. URL A thumbnail image relevant to the Thing. Duration Approximate or typical time it takes to work with or through this learning resource for the typical intended target audience, e.g. ‘P30M’, ‘P1H25M’. Text The typical range of ages the content’s intendedEndUser, for example ’7-9′, ’11-’. Number The version of the CreativeWork embodied by a specified resource. VideoObject An embedded video object. Text e.g. Painting, Drawing, Scupture, Print, Photograph, Assemblage, Collage, etc. Text e.g. Oil, Watercolour, Linoprint, Marble, Cyanotype, Digital, Lithograph, Pencil, Mixed Media, etc. Text e.g. Canvas, Paper, Wood, Board, etc. As mentioned above, this is a rough second draft. Any comments, additions, and criticisms, are much appreciated! 2nd draft: an idea for an alternative schema.org type for artwork by Paul Watson is licensed under a Creative Commons Attribution-NonCommercial-ShareAlike 3.0 Unported License. 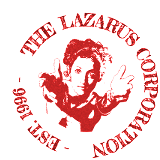 The Lazarus Corporation welcomes communication. You can send us a message through our contact form or join in the discussion through one of the social media sites listed below. Subscribe to our RSS and Atom feeds for regular reports of news about artwork and other projects. Sign up to our Email Newsletter to have occasional (about 4-6 times per year) news sent to your inbox. All content copyright © the individual artists and authors. Unattributed content copyright © The Lazarus Corporation 1996-2019. Some content on this website is licensed under Creative Commons or OPL - please check individual pages for details.